"He had sisters a young as this. It chilled him to think what might happen if one them were abandoned on the lonesome highway, the type of man with whom, in desperation, she might accept a lift." Although his growing uneasiness on the drive leads him to make plans to leave her at the border before crossing the state line into Arizona, that idea backfires and he takes her on into Phoenix. He drops her off at the bus station and she's gone. But the day after she makes a surprise visit to his hotel room, he hears an announcement on the radio about an unidentified girl. Grabbing the newspaper, he discovers that the body of a young girl has been found in a nearby Scottsdale canal. He quickly discards any idea of helping the police identify her, but later an anonymous tip sends the cops directly to him -- as a suspect. He hides the situation from his family and tells the police the bare outlines of his story, but he's just certain that they're going to pin the girl's murder on him. They delay an arrest, but growing ever more paranoid that it's going to happen at any moment, he spills everything to Ellen, a family friend in town for the wedding. Densmore now has no choice but to try to prove his innocence. He has to show that he played no part in the girl's murder before they take lock him away for good: "because of circumstance," he has been tagged as the "sacrificial goat," and he knows it. But time is ticking and no one but Ellen believes him. "The moon was high and white; each fence post, each clump of cactus was as distinctly outlined as by the sun. The mountains were moon-gray against the deep night sky. A dog barked from a distant house, the only reminder that they were not on a distant planet." The atmosphere she creates with phrases like these also reflect Densmore's own isolation throughout the story. 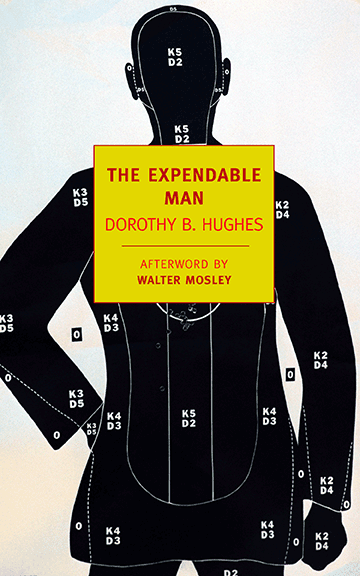 Her characters and dialogue are all believable as well, but beyond the normal components of this kind of fiction, Hughes also incorporates people from different walks of life into her story, all the while scrutinizing American attitudes regarding race, socio-economic status and crime in the early 1960s. The Expendable Man is among the best books I've read all year, and I can't recommend it enough. Sure, the wrongly-accused-man thing has been done before and for many modern readers used to the gimmicky serial killer type reads that top the charts today, it might come across as a little tame or outdated. But this book goes well beyond just another novel of crime fiction, spilling into the realm where empathy takes over: the reader remains trapped in Densmore's nightmare just as much as he is, up until the final sentence. That's how much power Hughes has over her audience. And I loved every second of it. Thank you! As I always say, good books write their own reviews.